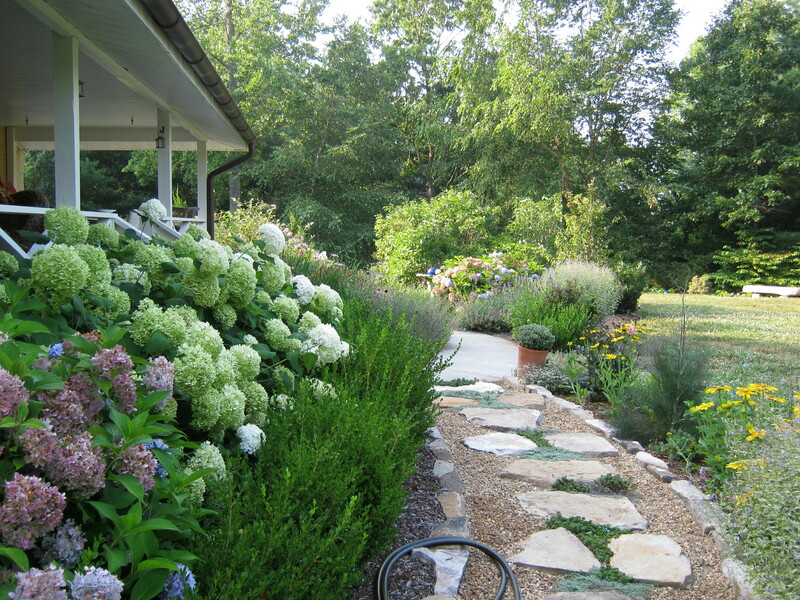 I have one design client who told me, “Absolutely no hydrangeas of any kind!” Really? Well, she’s the only person I’ve meet who doesn’t like at least one species of this wonderful genus. There are so many garden-worthy hydrangeas that offer more than just summer blooms. Last week, Amanda and I pruned Hydrangea paniculata ‘Tardiva’ in the Formal Garden. Hydrangea paniculata is a big plant and should be sited with this in mind. 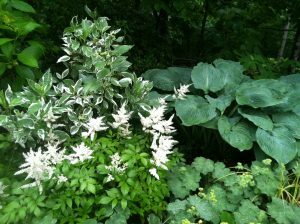 I planted six of these in a 30 foot border for late summer effect – ‘Tardiva’ blooms later than most paniculatas – with the intention that they would be pruned hard each spring to keep the size right. Once you know the rules, feel free to break them. This species of hydrangea blooms on new wood so spring pruning will not cut off the summer flower bud. It is spectacular in late summer and the faded flower heads are striking against a winter sky. Another terrific plant is Hydrangea quercifolia, Oakleaf Hydrangea, a true year-round plant. In both sun and shade, this hydrangea offers a lovely floral show in early summer, burgundy fall leaf color, and a nice architecture and peeling bark to enjoy in winter. Hydrangea quercifolia blooms on old wood, so I carefully remove last year’s flower without cutting any wood which carries the current year’s flower buds. Newer varieties offer smaller size such as ‘Ruby Slippers’, and interesting gold leaf color on ‘Little Honey’. Hydrangea arborescens ‘Incrediball’ is supposed to have sturdier stems. I’ve planted a couple of these very near the ‘Annabelle’ as a pseudo-science experiment. The flowers on ‘Incrediball’ have not gotten as large as ‘Annabelle’ and the hard mid-summer rain hasn’t materialized at just the right moment. Results are still out. A couple pink varieties have hit the market, but I prefer the white. I have planted a single of ‘Haas Halo’ which is more typical of the species with a lacecap flower, but showier. Not much to write home about yet, but it’s only been in the ground about 18 months. 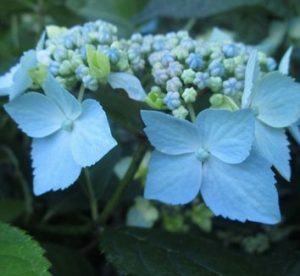 As for pruning Hydrangea arborescens, this is another plant that flowers on new wood, so I prune last year’s stems to about eight inches in early spring. You can actually cut these to the ground, or as Michael Dirr says in his Manual of Woody Plants ‘mow it down’, but I leave a bit of the old stems as support for the new ones. Hydrangea macrophylla ‘Endless Summer’ – having a good summer! I have only the briefest comment on Hydrangea macrophylla … it is a truly lovely spectacle of summer, that is when the flower buds are not ruined by our typical late frosts. I’ve had incredible shows and total busts. 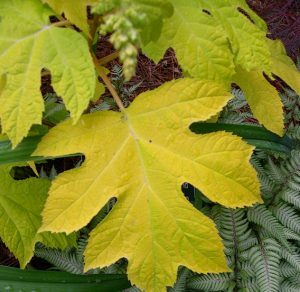 I have Hydrangea macrophylla ‘Light-o-Day’ which has a variegated leaf that gives the plant some interest regardless of bloom or no bloom. Seen here with Astilbe ‘Deutschland’ and Hosta ‘Blue Angel’. 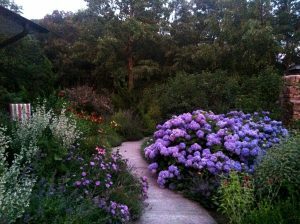 There are many other wonderful hydrangea species and I recommend Dirr’s Hydrangeas for American Gardens as the ultimate reference. Hydrangea serrata ‘Blue Deckle’ is one of my treasured plants. It grows in a pot and over winters in the conservatory so I never miss the flower. My favourite is H. Paniculata “Limelight”. Lovely colouring with just a hint of lime in the summer blooms with gorgeous fall colour. It seems to do well just about any where although the sun it gets is morning only. I agree – Limelight is wonderful! Subscribe to get notified about new features and promotions. 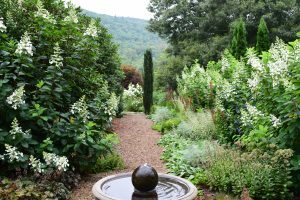 Nancy Duffy is owner of Muddy Boots Garden Design and has been designing (mostly) residential gardens in Asheville, NC since 2001. She is an avid gardener and certified plant nerd. She lives and gardens on four acres with her husband Dennis and Gidget, their German Shepherd Dog. Dennis Duffy is a marketing consultant and blogger. In his off time, he is an avid runner and cross trains by moving mountains of mulch and compost. The illustrations on this website were done by Nancy Duffy. She also does custom drawings from photographs. 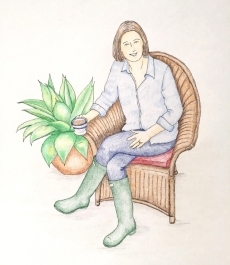 Click here to learn more about her Garden Portraits. © 2019 Muddy Boots Plant Tags. All Rights Reserved. Website by Lydia Roberts Design.